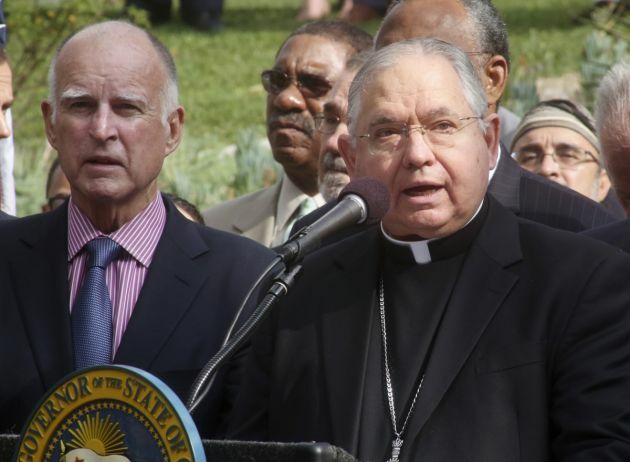 (Photo: REUTERS / Fred Prouser)California Governor Jerry Brown (L) listens to Los Angeles Catholic Archbishop Jose Gomez during ceremonies before Brown signed AB60 into law in Los Angeles October 3, 2013. Illegal immigrants living in California may soon be able to apply for driver's licenses under a law signed on Thursday by Brown, in the latest in a string of moves expanding privileges for such immigrants in the most populous U.S. state. The move marked a major victory for Latino and immigration rights activists who have fought for decades for such a law, which was expected to spur 1.4 million people to apply for licenses over the next three years. Almost 600 Catholic men will be ordained priests for the United States in 2015, an increase of more than 100 from last year says a research center based at Georgetown University. The total number of potential ordinands for the class of 2015 is 595, up from 477 in 2014 and 497 in 2013. Bishop Michael F. Burbidge of Raleigh, North Carolina, chair of the U.S. bishops' Committee on Clergy, Consecrated Life and Vocations, said April 7 the increase in ordination numbers is "encouraging." He found that the data gave reason for hope but also provide areas for further growth, he was reported as saying on the U.S. Conference of Catholic Bishops website. The 2015 class of men ordained to the priesthood report that they were, on average, about 17 when they first considered a vocation to the priesthood and encouraged to consider a vocation by an average of four people, the research found. Seven in 10 (71 percent) say they were encouraged by a parish priest, as well as friends (46 percent), parishioners (45 percent), and mothers (40 percent). On average, they lived in the diocese or eparchy for which they will be ordained for 15 years before entering seminary, the Georgetown University-based Center for Applied Research in the Apostolate (CARA) found. Religious ordinands knew the members of their religious institute an average of six years before entering. "It is encouraging to see the slight increase in the number of ordinations this year in the United States," Bishop Burbidge said. "When asked about the positive influences they encountered while discerning the call, those to be ordained responded that the support from their family, parish priest, and Catholic schools ranked very high." • The average age for the Class of 2015 is 34. This distribution is slightly younger than in 2014, but follows the pattern in recent years of average age at ordination in the mid-thirties. • Two-thirds (69 percent) report their primary race or ethnicity as Caucasian/European American/white.